In a Large Enterprise say for example if we consider a Infrastructure Management Team we would be having a Number of Teams, Maybe one could be Exchange Team, Storage Team, Network Team and Maybe a PKI team.Delegated administration allows us to segregate control on powershell to admins based on their respective teams, or may be hierarchy level of Seniority amongst the team. With PowerShell V3 Microsoft provides us with Two ways to delegate administration. Session Configuration Files – It allows us to define a endpoint on a machine which exposes only the cmdlets and modules which we want, it can be configured by configuring a .psd1 file. RunAS – It allows to configure a session configuration and specify which set of credentials should be used in that session configuration. The Get-PSSessionConfiguration cmdlet gets the session configurations that have been registered on the local computer. This cmdlet is used by system administrators to manage customized session configurations for their users. Beginning in Windows PowerShell 3.0, you can define the properties of a session configuration by using a session configuration (.pssc) file. This feature lets you create customized and restricted sessions. 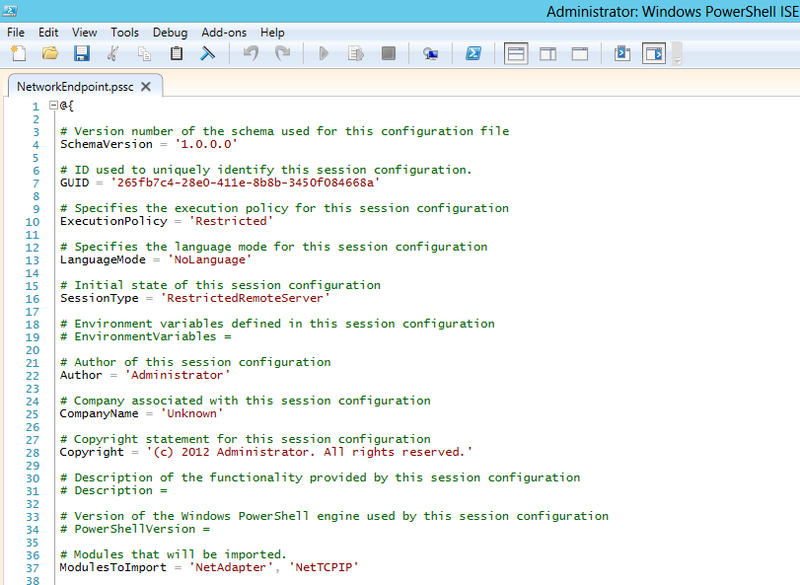 So if i do a Get-PSSessionConfiguration i get the list of all PSSession Configurations existing on my local system. When ever we use Remote Session cmdlets its uses microsoft.powershell session configuration by default, its restricted only for administrators to connect to it. Now to allow team specific administration levels i need to create a new pssession configuration. So as discussed lets create now three of them for storage, exchange and network team, also please do note none of the members of the groups or the group itself is a part of administrators group on the server. Hence we are delegating the permissions. Next i can set these session configurations to run commands with administrator credential. Now we would create a session configurations files to restrict powershell access as per team requirements. We would be using New-PSSessionConfigurationFile cmdlet and specify the path where the session configuration files needs to be created, also specify the modules which needs to be imported also specify the cmdlets which needs to be visible and the session type to be used to have an interactive remote session with the server. So let me show you an example for our Networking Team First. Now i will go ahead and create the PSSessionConfiguration and point it to session configurationfile using Register-PSSessionConfiguration. So let me now create it for Networking Team. 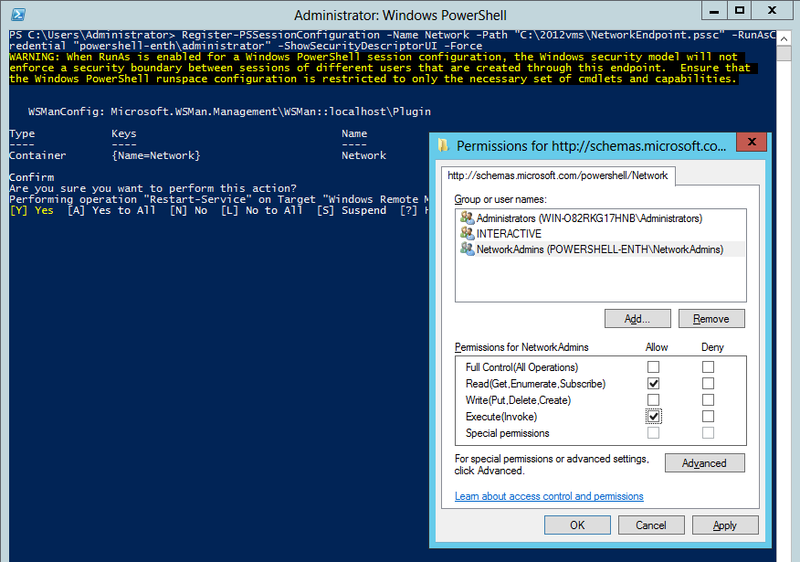 Once i assign the required permissions (execute) to the networkadmins they would be running the commands for NetAdapter and NetTCPIP modules under context of powershell-enthadministrator who is the administrator for the server. Now if i again connect as NetworkAdmin who is a part of NetworkAdmins group using the Networkendpoint, im able to see that i have a restricted set of cmdlets to use which are all related only to networking. PS C:Windowssystem32> $s = New-PSSession -ComputerName localhost -ConfigurationName Network -Credential "powershell-enthnetworkadmin"
Similarly we can create delegate cmdlet permissions to admins based on their team type and keep them restricted only to cmdlets dealing with their technology expertise.